Choose Global Industrial Light Duty Natural Trash Bags for light trash loads, including newspapers, magazines, rags, linens, paper towels and tissue. Ideal for office buildings and restrooms, lodging and healthcare, linen collection and guest room trash, grocery and convenience and food service areas with high percentage of paper or wet, bulky trash. 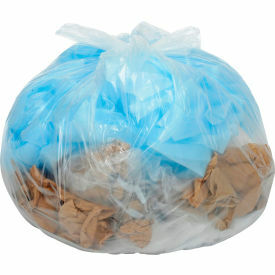 Manufactured from 100% virgin high molecular weight High Density Polyethylene(HDPE) resins, the bag's 0.62 Mil thickness offers an excellent stretch and durability properties. Star seal bottom provides optimal fit to receptacle, even load distribution and superior leak protection. Natural color helps to monitor trash, sort recycled material, and collect linens. Each bag measures 41in. x 52in. for a superb fit into 55 Gallon brute style receptacles. Packaged in coreless rolls, which simplifies inventory control, distribution and accountability. One case contains 8 coreless rolls of 25 bags each for a total of 200 bags per case.